Lovely Laura Ashley Baby Gear! 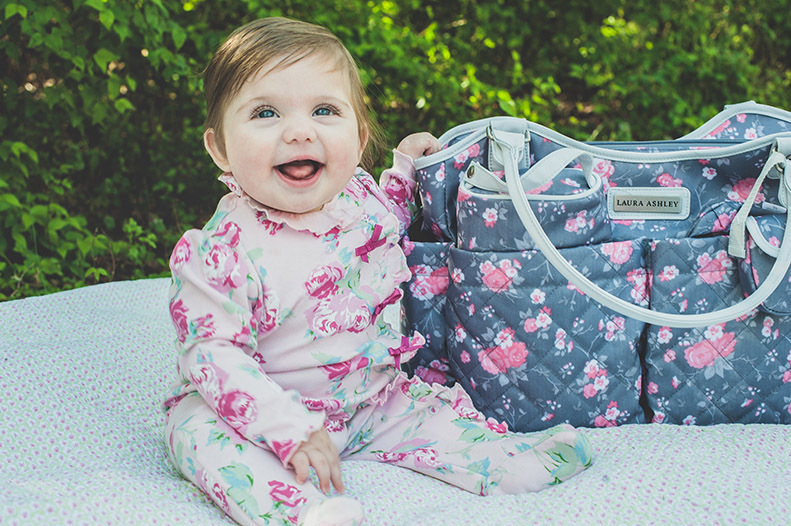 We are delighted to have the Gugu Guru herself blog about our new Laura Ashley diaper bags and feeding products! Created to delight new and expecting moms, Gugu Guru delivers you your perfect baby registry match, unbiased product recommendations from industry experts and other moms to suit your individual style. If you grew up anytime in the 1980s, you probably wore a Laura Ashley headband, dress, or bow in your hair. Our editor in chief’s bedroom was swathed in Laura Ashley, from the curtains to the wallpaper, to the quilt on the bed! Laura Ashley is a quintessential English lifestyle brand, and has evolved seamlessly into the modern day. We are overjoyed and honored to be introducing you to the Laura Ashley baby line today; combining their classic floral patterns with updated baby essentials, we are sure you’ll be swooning for this lovely baby gear. 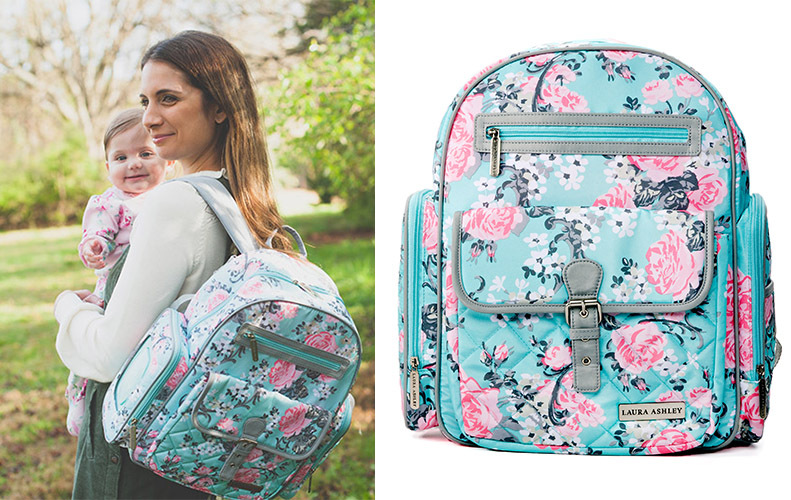 This gorgeous Laura Ashley diaper bag is a handy backpack, with padded straps for added comfort for mama, and it even has adjustable stroller straps, too. 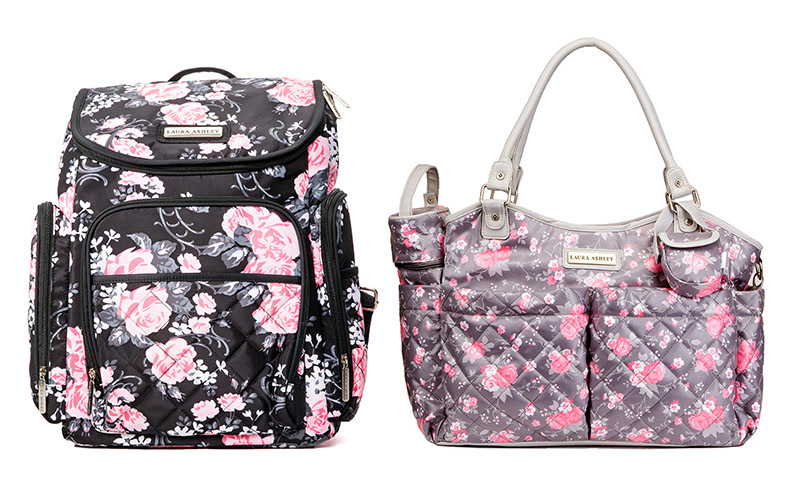 This floral printed roomy top zip backpack is made from microfiber that easily wipes clean. There are 2 side pockets, one that holds a pop-up wipes case and one that is large enough to hold a baby bottle or bottle of water. On top of the side pocket is a second pocket with a magnetic closure for even more storage, and there are another two pockets on the front of this bag as well. The large front pocket allows for easy access to your keys, cell phone or other necessities while the smaller top pocket is great for smaller items. The main compartment has a contrast pink lining with 3 easily accessible internal pockets and an additional back zip pocket to help with organization. The bag comes with a cushioned changing pad and a wet pack for wet or dirty diapers or clothes. 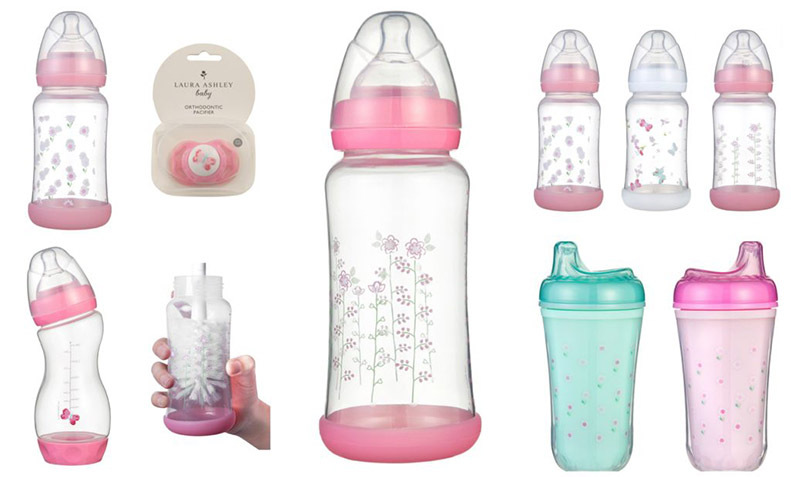 If the diaper bags aren’t adorable enough for you, check out their truly lovely bottles and sippy cups! They offer bottles 5, 9, and 11 ounces and even have an angled bottle. 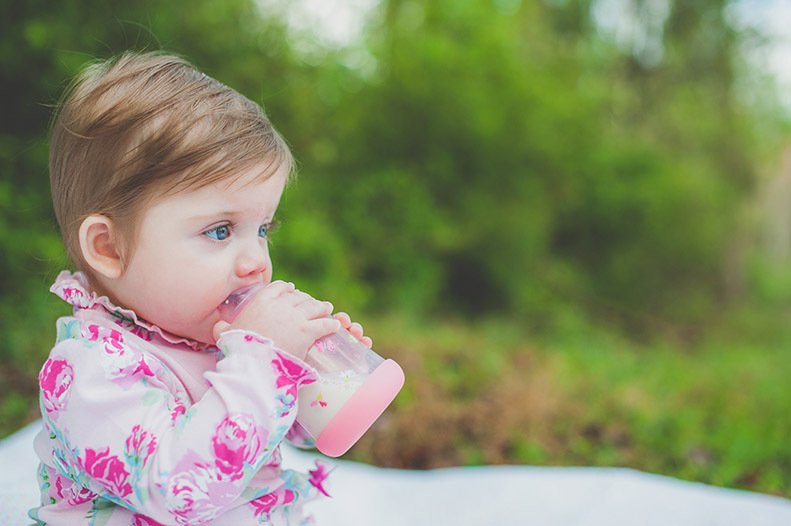 Their sippy cups are double insulated and have the sweetest little designs on them. 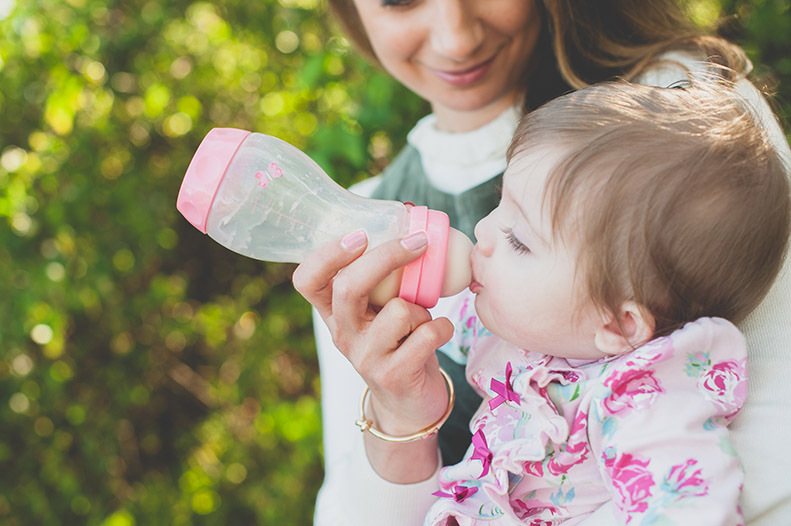 Everything is BPA free and easily washable. Finishing up the layette is their accessories, including a classic bottle brush which would look wonderful in any kitchen, and makes washing those bottles (almost) joyful. 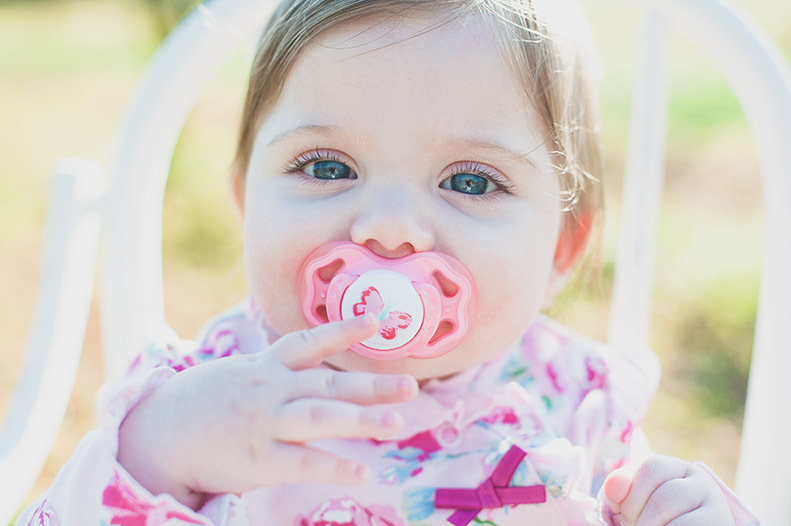 And, of course, a lovely little pink pacifier featuring a butterfly (also BPA free). Laura Ashley combines elegance, style, and functionality with their new baby line. Don’t forget to check out their oh-so-sweet baby clothes, too! This entry was posted in Favourite Posts, In Style and tagged babies r us, baby bottles, baby gifts for her, baby girl gifts, baby girl outfits, baby shower gifts, bottle brush, bottles, diaper bag, diaper bag backpack, diaper bags, floral bottles, floral diaper bag, flower diaper bag, girls bottles, laura ashley, pink bottles, pink pacifiers. Bookmark the permalink.